Modern condo right across the street from the lifts, shopping, and restaurants. Relax in your oversized jet tub after a day of play on the mountain. Cozy up around the fireplace while you are wowed by the view! 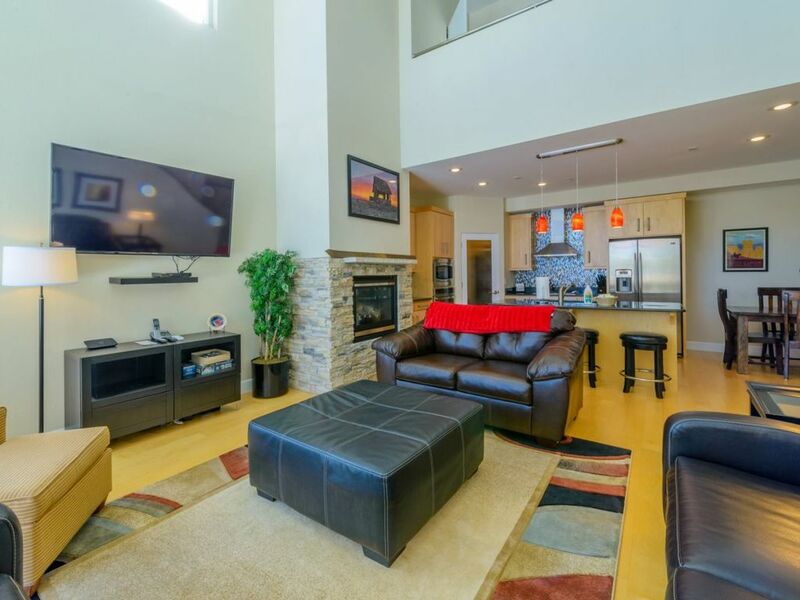 This stunning and modern two bedroom, two and a half bath, 1,900 square foot condo is conveniently located directly across from Giant Steps with expansive views of the slopes. Relax after a day of skiing, biking or hiking, by the fireplace, playing foosball or just sitting on the balcony taking in the breathtaking scenery. One large single garage will fit a truck or SUV with plenty of room to spare for skis and other toys. The condo sleeps 8 comfortably. Two spacious bedrooms have a California king in the upstairs master with a plush memory foam mattress, and a standard king downstairs with a foam mattress and memory foam topper. A trundle day bed in the loft with two memory foam mattresses is great for two kids. Sleep in comfort to recharge for another day of fun. Each of the two full baths has double sinks. The master bath has a jetted tub and separate shower, while the downstairs bath has a shower bath combination. The half bath is conveniently located in the loft. For longer stays feel free to use the washer and dryer to refresh your clothes. The open kitchen is well stocked with plates, bowls, glasses, mugs, utensils, knives, gadgets and large and small appliances. Do anything from warming leftovers to making holiday family meals. Grill burgers and dogs on the gas grill on the lower balcony. At only three hours from both Las Vegas and Salt Lake City, Brian Head is close enough for a quick trip but far enough to keep the crowds away. Enjoy the new high-speed quad to Giant Steps and spend no time in line. The famous Utah powder awaits in the winter, with mountain biking, hiking and off-roading in the spring, summer and fall. Take a day trip to Cedar Breaks, Bryce or Zion. Enjoy Utah’s best-kept secret in the Dixie National Forest. Bedrooms - The bedroom downstairs has (1) king bed. . Upstairs master has (1) king bed and the loft has (1) queen pullout bed. There are two pullouts downstairs in the living room (1) queen and (1) twin. Bathrooms – There is one full bath upstairs with jacuzzi tub and one full-bath downstairs. Kitchen – There is a full kitchen with an electric stove/oven, microwave, dishwasher, and full-size refrigerator/freezer. The kitchen includes a basic set of plates, cups, utensils, pots/pans, and other kitchen items. Laundry/Linens – The condo includes all bed linens, towels, and blankets. All laundry of the condo provided linens is included in the cleaning fee. There is a full size washer and dryer in the closest upstairs. Entertainment – There is a TV with basic cable channels. Family Time Vacation Rentals specializes in managing privately owned cabins-homes, lodges and condos. We are hands on and live where are properties are located. My wife and I started our business in 2008 after deciding we wanted to give our children the simpler life of living in the country. Our business is built on the concept of providing comfortable lodging to families and individuals who want to feel the comforts of home while away on vacation. With over seven years of experience in the nightly rental business, we consistently work to provide top quality properties at affordable rates. A large percentage of our guests who visit the area and stay with us become repeat customers because they had a great time and have said the accommodations and beautiful landscape of where their vacation home was located were exceptional. Excellent Location and a great price! There was more than enough space for eight people to sleep and be comfortable. Nice base between Zion and Bryce Canyon. Excellent value and our group of 7 was thoroughly impressed. Drive about 5-10 minutes out of town for a great night sky. You can also jump over a van on a mountain bike (if you can find it). * Kitchen was well equipped. Layout is spacious and updated. The property manager was professional, prompt, and accurate. We'll stay again if returning to the area. The condo was perfect for our family of six. Loved it! My biggest thing is if a place is clean and updated. I don't want to stay somewhere that's not home and feel grossed out. We loved this place -- it was clean, had lots of space and a fabulous location! And TV, wifi, room for the kids, and a washer/dryer! Would def stay here again! Wonderful holiday stay in this new, spacious, and clean place. We had one issue with the water heater, we called and it was fixed with in 3 hours on Christmas Day. We had no hot water the first day, then had to re-light the pilot light 30 minutes before we wanted hot water for anything because the pilot light would not stay lit. I contacted management to ask about possibly some concessions on our fees for our stay but to date have not heard anything. For the cost of three nights I would have expected better communication. I found out also that they had worked on the water heater the day before we arrived but we still had our issues. Disappointed is all I can say as far as customer service is concerned. The water heater issues aside the property was clean, well stocked and the view was awesome. The proximity to the slopes was a huge positive and I loved sitting in front of the fire looking at the resort/slopes. While the driveways were plowed we had to shovel to get into the garages.